I've had several requests lately to share a recipe or two. 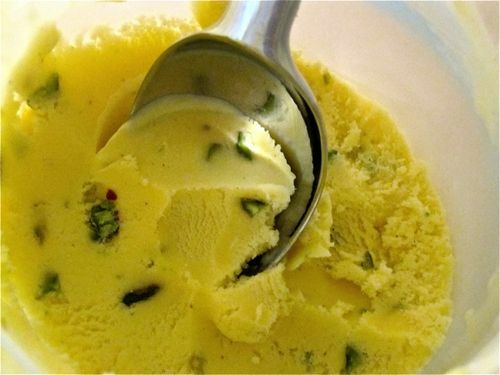 Thought it might be nice to offer up the recipe for one of my all-time favorite Indian-inspired frozen confections -- Saffron Cardamom Pistachio Ice Cream. Combine milk, heavy cream and saffron in a saucepan and stir over medium-high heat until beginning to boil. Take off the heat and allow the saffron to steep for an hour to an hour and a half and the mixture is bright golden yellow. In a separate bowl whisk together yolks, sugar, corn syrup, salt and ground cardamom. Put the saucepan with the golden milk mixture back on the heat until simmering. Add the heated mixture a 1/2 cup at a time to the bowl with the eggs and sugar, whisking vigorously to temper, not allowing the eggs to scramble. Then pour the mixture back into the saucepan and cook over medium heat, stirring constantly until it forms a custard, thick enough to coat the back of a spoon. Strain through a fine sieve. Allow to thoroughly cool in the refrigerator for at least 6 hours or overnight. Freeze in an ice cream maker, adding pistachios midway through the churning process. Place ice cream in the freezer for at least 3 hours before serving.